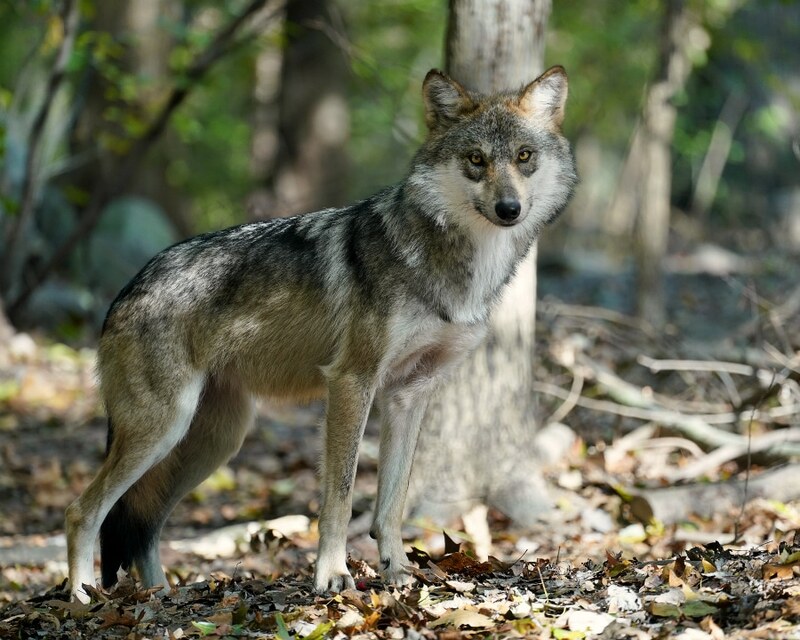 The Wolf Conservation Center (WCC) participates in the federal Species Survival Plan (SSP) recovery programs for the Mexican gray wolf and the red wolf, two of the rarest mammals in North America. Both species at one time were completely extinct in the wild. Since 2003 the WCC has played a critical role in preserving and protecting these imperiled species with through carefully managed breeding and reintroduction. 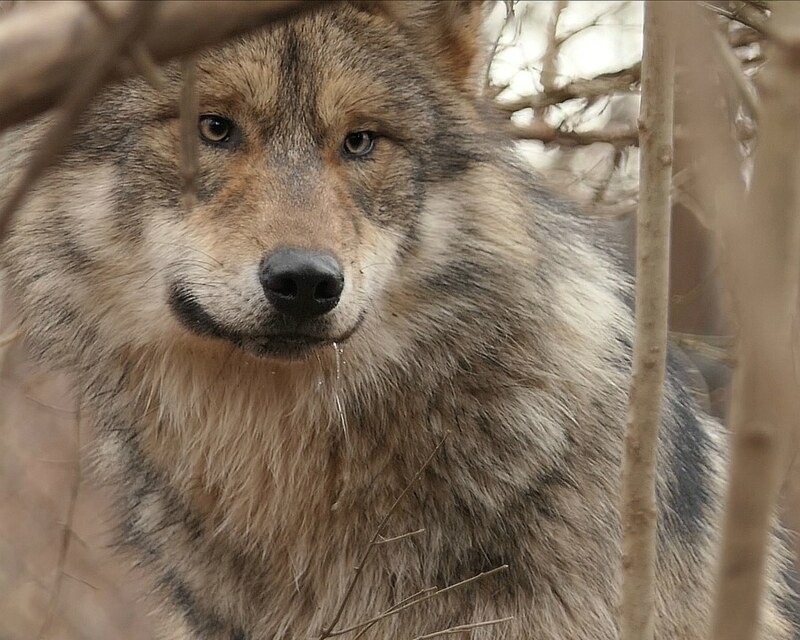 To date, the WCC remains one of the three largest holding facilities for these rare species and four wolves from the Center have been given the extraordinary opportunity to resume their rightful place on the wild landscape. What is a Species Survival Plan? A Species Survival Plan (SSP) is a breeding and management program designed to ensure the long-term sustainability of captive-based animal populations. 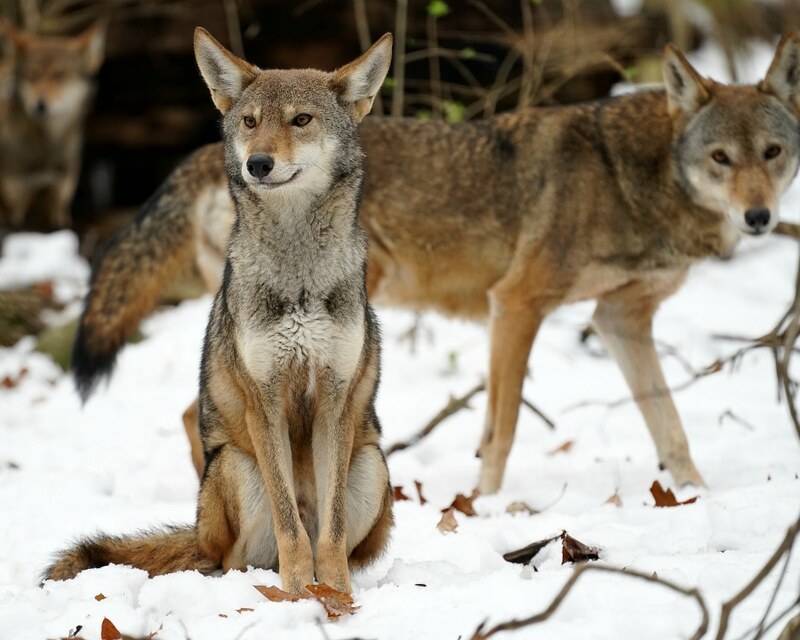 It’s a coordinated effort among zoos, organizations like the Wolf Conservation Center, U.S. Fish and Wildlife Service, Mexico’s Fish & Wildlife Agencies and managed under the Association of Zoos and Aquariums (AZA). The Mexican gray wolf (Canis lupus baileyi) or “lobo” is the most genetically distinct lineage of gray wolves in the Western Hemisphere, and one of the most endangered mammals in North America. By the mid-1980s, hunting, trapping, and poisoning caused the extinction of lobos in the wild, with only a handful remaining in captivity. In 1998 the wolves were reintroduced into the wild as part of a federal reintroduction program under the Endangered Species Act. Today in the U.S., there is a single wild population comprising only 114 individuals - a slight increase from the 113 counted at the end of 2016. Mexican gray wolf F1143, affectionately known as “Rosa,” was born at the WCC in 2008 to Mexican gray wolf F613 (Mama Gray) – she and her siblings were the first Mexican wolves born at the WCC! Over the years, Rosa has said farewell to most of her family members, but she’s had the opportunity to build a new family of her own. In 2015, F1143 was introduced to Mexican gray wolf M1059 (Diego), and the pair quickly bonded, spending many days cuddling on top of their den and sharing meals. Their bond was quite evident when, in the spring of 2016, Rosa gave birth to a daughter, f1505 (nicknamed “Trumpet” for the loud squeals she made as a newborn). The family of two became a close-knit family of three and WCC staff and supporters rejoiced at the apparent happiness and love felt by the trio. Unfortunately, their days as a family unit were numbered. As part of the Mexican wolf Species Survival Plan (SSP), certain Mexican wolves are paired for breeding each year based on the genetics of both the wild and captive populations. 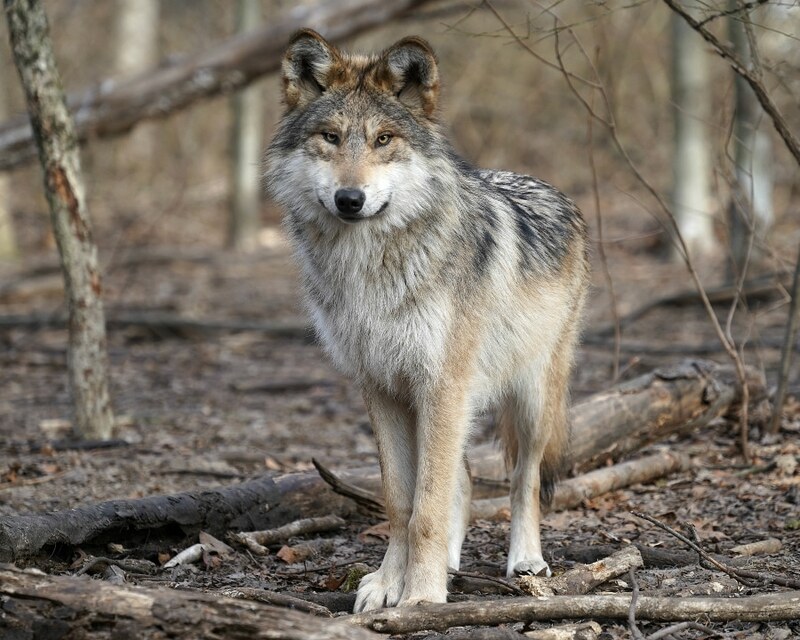 Rosa was found to be a perfect genetic match for Mexican wolf M1198 (Alléno), another WCC male, so she bid farewell to Diego and Trumpet in the fall of 2017 and slowly began to form a bond with Alléno. Jump to May 8, 2018; Rosa reveals that love can strike a second time with the birth of nine pups - six males and three females! Although the family of eleven resides off-exhibit at the WCC, webcam watchers love watching Rosa and Alléno chase their baseball team of pups! One of our most popular Mexican gray wolves, “Rhett” was born at the California Wolf Center in 2008 and has lived an adventurous life. USFWS released him into the wild in 2013 with the hope that he would become the alpha male of Arizona’s Bluestem pack after the previous alpha male was killed. Unfortunately, Rhett failed to capture the attention of the pack’s alpha female so three weeks after his release he was placed back in captivity. While at USFWS’s captive breeding center he was paired with a wild-born female and this pair was released in the spring. However, Rhett and his mate traveled in the wrong direction and ultimately ended up near human settlements in an area with very little natural prey. Similar to his previous release and capture, Rhett was once again placed in captivity and he has lived at the WCC ever since. Rhett’s new mate (F810 or Scarlett) passed away in March 2015. 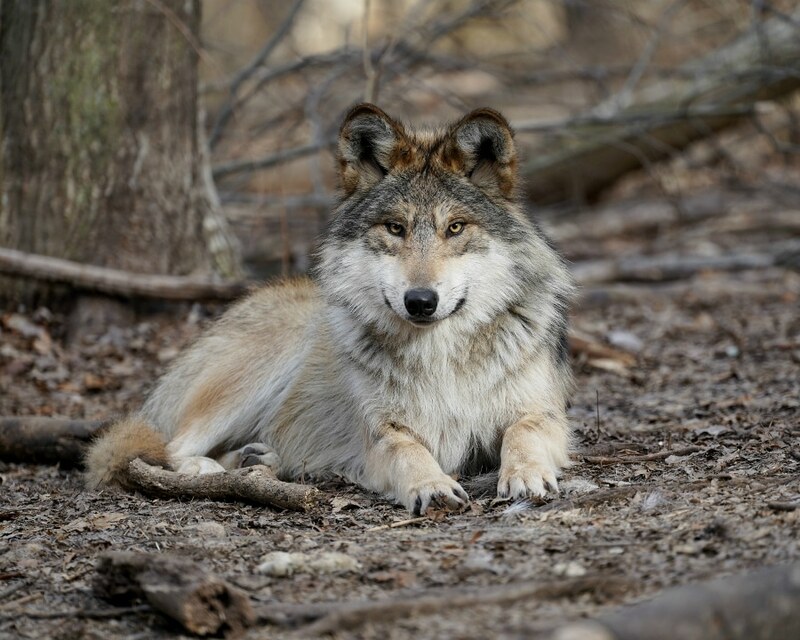 In the fall of the following year, he was introduced to Mexican wolf F1226 (Belle) and their union proved fruitful: Belle gave birth to pups m1506, m 1507, and f1508 in the spring of 2016! The pair bond between Rhett and Belle proved to be quite strong, as Belle gave birth to yet another litter of pups in 2017. The family welcomed pups f1619, f1620, and f1621, growing their family of five to a robust family of eight! Although the family resides off-exhibit at the WCC, webcam watchers love observing the dynamic relationships bewteen the members of the multigeneration pack. 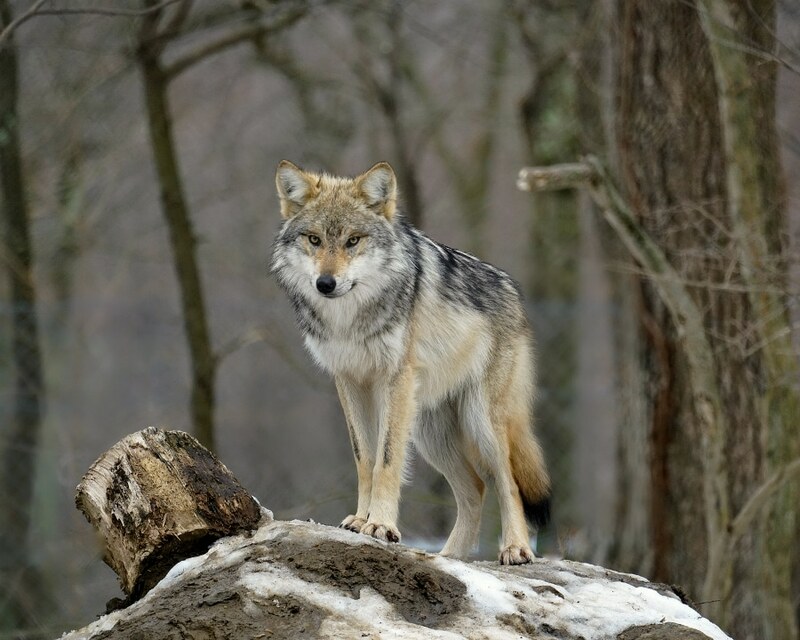 Mexican gray wolf M1198 (a.k.a. Alléno) was born at the Endangered Wolf Center on May 2, 2010. 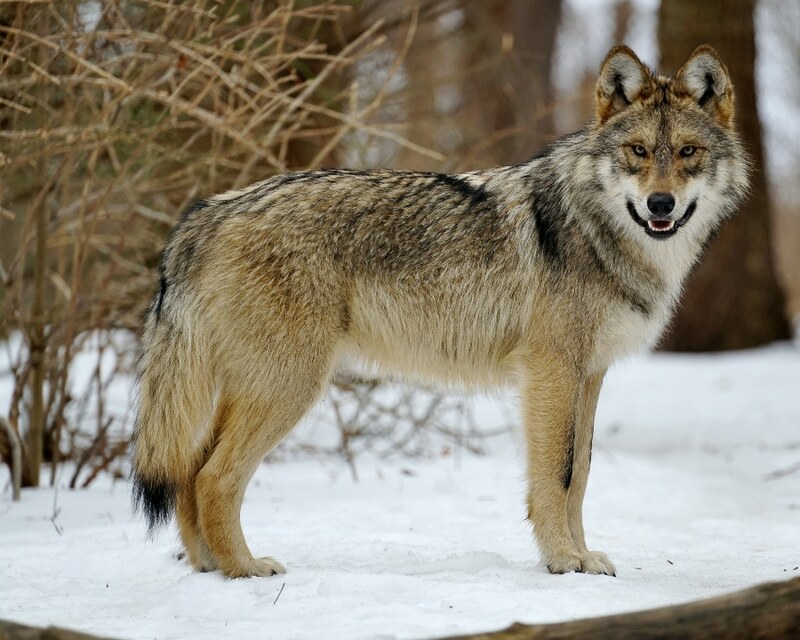 The handsome fellow was transferred to the Rio Grande Zoo in 2012 and joined the Wolf Conservation Center family in October of 2014 to accompany Mexican wolf F749 (a.k.a. Bella). Sadly, just over a year after their introduction, his female companion passed away. She was 13 years old. 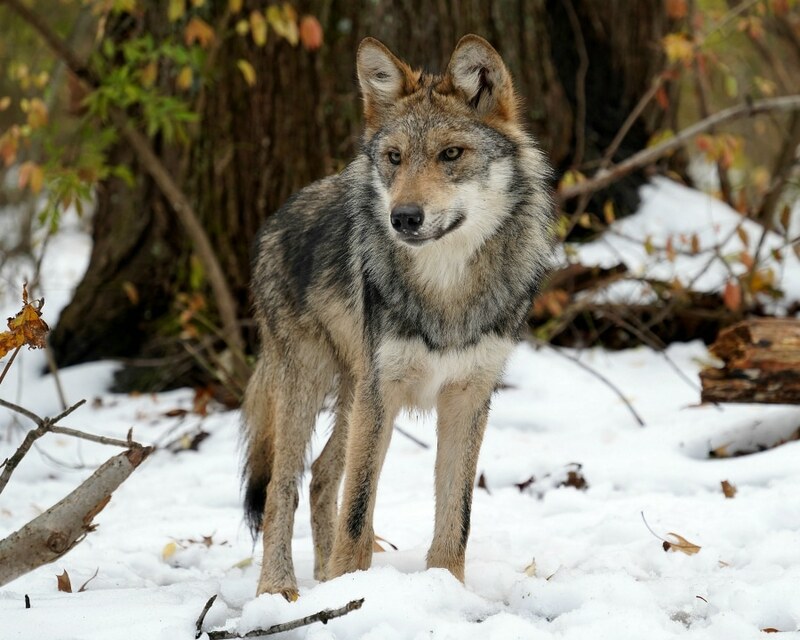 Alléno briefly lived with a companion, F1435 (Magdalena), but was introduced to Mexican gray wolf F1143 (Rosa) in the fall of 2017 in the hopes that the pair would contribute to the genetic growth of their critically endangered species with pups. Jump to May 8, 2018; Alléno and Rosa welcome nine pups - six males and three females! Whoa! Although the family of eleven resides off-exhibit at the WCC, webcam watchers love watching Rosa and Alléno chase their baseball team of pups. F1226 (Belle) was born at the California Wolf Center on April 30, 2011. 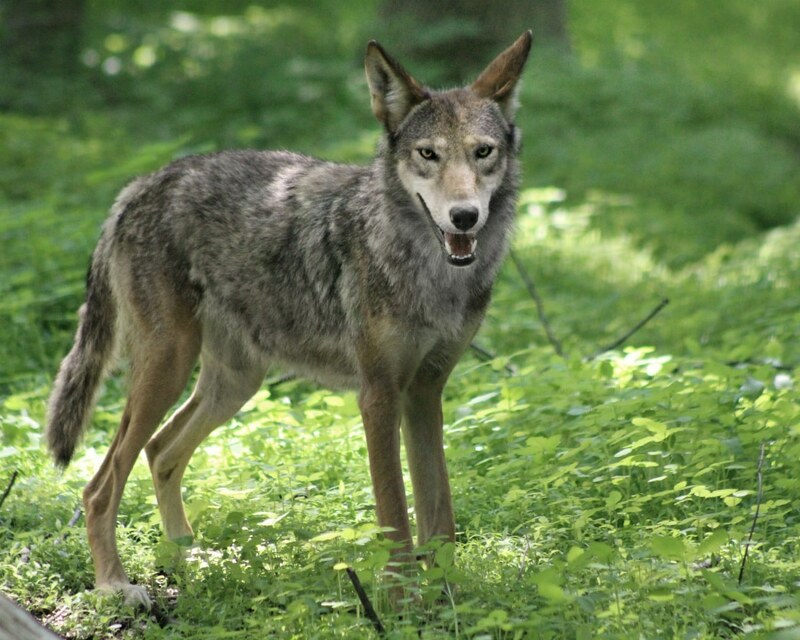 In August of 2013, the loba was transferred to U.S. Fish and Wildlife’s Sivilleta Management Facility in New Mexico where she was paired with M1336 following year in hopes the wolves would whelp pups in captivity and then be released in the wild shortly thereafter. The pair failed to prove fruitful. On October 14, 2015, Belle joined M1133 (Rhett) at the Wolf Conservation Center and luckily, the pair got along quite well! Belle gave birth to a litter of three pups (m1506, m1507, and f1508) in the spring of 2016 and ANOTHER litter of pups (f1619, f1620, and f1621) in 2017! Fun Fact – This beautiful loba is permanently plump (or big boned…) – she's just built that way! Mexican gray wolf M1059 – “Diego” was born at the California Wolf Center on April 22 (Earth Day!) of 2007. He and his two brothers, M1058 (Chico) and M1060 (Durango), were transferred to the Seneca Zoo in 2011. The trio joined the Wolf Conservation Center family in November of 2015, but WCC was merely a pit-stop for M1058 and M1060. Just weeks after their arrival, they returned west to reside at the Living Desert Zoo and Gardens in Palm Springs, CA. Although Diego no longer lives with his brothers, the handsome dark lobo remains among family as his younger brother, M1133 (Rhett), also calls the WCC home. Diego was introduced to F1143 (Rosa), and the pair welcomed a pup, f1505 (Trumpet) in the spring of 2016. In the interest of expanding the genetic diversity of the Mexican wolf population, Diego and Rosa were separated for the 2018 breeding season, after which Rosa produced nine pups with Mexican gray wolf M1198 (Alléno). Love stuck a second time for Diego as well, today he lives with his new lady companion, F1435 (Magdalena). On the morning of May 4th, Mexican gray wolf F1143 (Rosa) gave birth to a single pup (f1505) – a robust little girl nicknamed “Trumpet” for her loud squeals. Unbeknownst to the kiddo, Trumpet had been warming the hearts of a global audience via the WCC's remote webcams. Her fans were elated to learn that she would be introduced to a new lobo in town during fall of 2017 -Mexican gray wolf M1564 (LightHawk). On April 30, Trumpet welcomed three pups of her own. Following in their mother’s footsteps, the noisy newborns entered the world amongst a chorus of sounds. Trumpet’s solo act grew into an orchestra of growls, yips, and peeps! The squeaky noises are not only adorable but are so rarely heard on the wild landscape. Just before midnight on May 25th, Mexican gray wolf F1126 (a.k.a. Belle) gave birth to three beautiful pups - two boys and a girl. m1507, a.k.a. Maus, looks a lot like his father - they share the same nose! In addition to being adorable, the critically endangered kiddos are valuable contributions to the recovery of their rare and at-risk species. 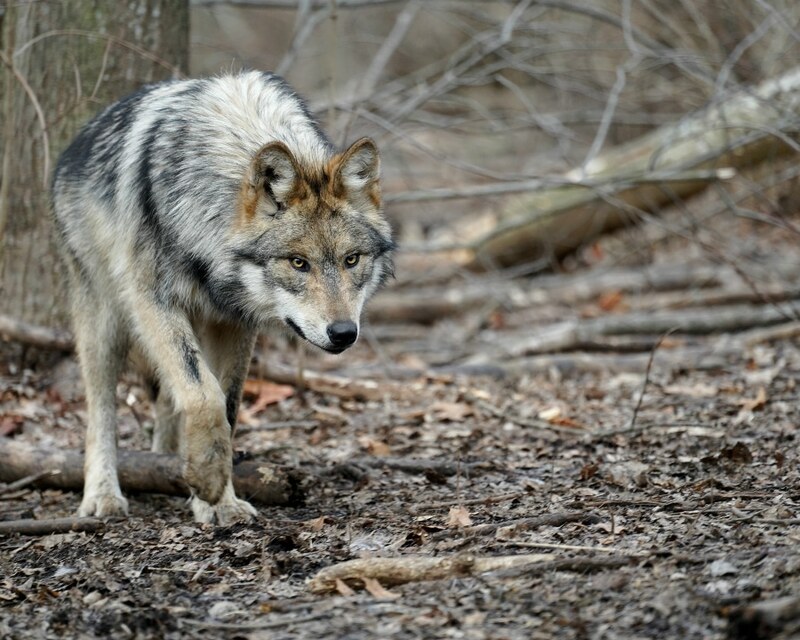 F1435 (Magdalena) arrived at the Wolf Conservation Center from the Brookfield Zoo in Brookfield, IL in November of 2016. She lives on exhibit with Mexican gray wolf M1059 (“Diego”). The dark beauty was born on May 29, 2015 and is the older sister to two wolves who received the “call of the wild” in April of 2016. As pups, her younger siblings were placed in the den of the Arizona-based Elk Horn Pack of wild wolves with the intention that the pack’s adults would raise the two with its own litter. In this process, known as “cross-fostering,” very young pups are moved from a litter at a zoo or wildlife center to a wild litter of similar age so that the receiving pack raises the pups as its own. 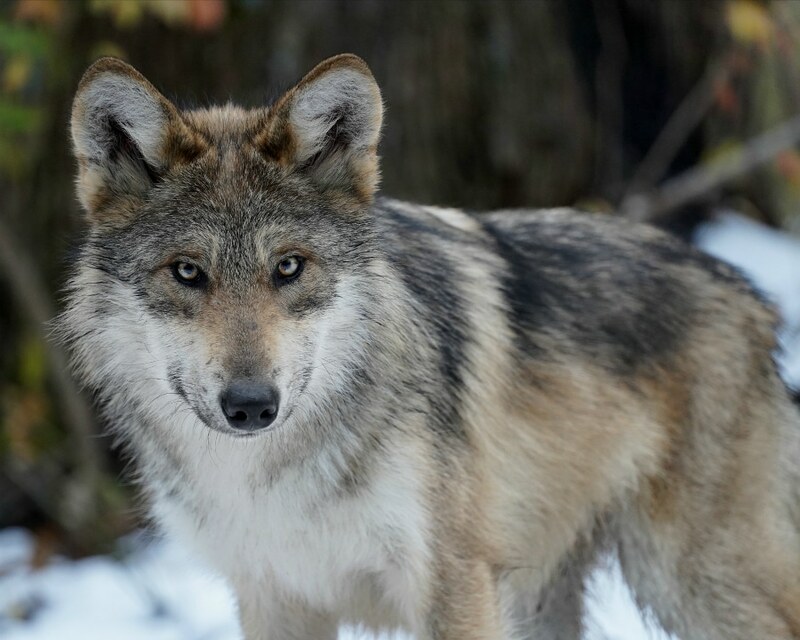 The technique, which has proven successful with wolves and other wildlife, shows promise to improve the genetic diversity of the wild wolf population. At first glance, M1564 (LightHawk) seems like every other Mexican wolf residing in the Wolf Conservation Center’s Endangered Species facility: elusive, endangered, essential. But the shy male has experienced something only very few lobos have – the wild. Born around April 15th, 2015, LightHawk spent most of his young life roaming the vast terrain of the Apache-Sitgreaves National Forests as a member of the Hawks Nest Pack but his life as a wild lobo came to a devastating end when he was removed from the wild in the fall of 2016 for attacking livestock. The elusive male was then flown to the WCC in 2017 via a series of private flights (thanks to the organization Lighthawk) and introduced to a spacious enclosure, where he now resides with f1505. The feisty female, affectionately known as “Trumpet”, captured the hearts of WCC staff and supporters when she was born to parents M1059 (Diego) and F1143 (Rosa) in 2016. Webcam viewers were entertained by her boundless energy and endless antics, and were overjoyed upon learning about her union with LightHawk. The pair has enjoyed months of “newlywed bliss,” but their honeymoon stage came to a close on April 30, 2018, with the arrival of three pups - two males and one female! On May 22, Mexican gray wolf F1226 (affectionately nicknamed Belle by supporters) gave birth to a litter of three pups - all females! This is the second litter born to mom (age six), and dad (M1133 or Rhett), (age nine). With parents, newborns, and the pair’s three yearlings born in 2016, the public has an opportunity to study the complex social structure of a multigenerational pack. Unbeknown to the wolves, WCC webcams allow a global audience to observe their behavior 24/7. Mexican gray wolf f1620 (Max) is the boldest of her littermates. She's always first to investigate anything new, especially if it something edible! On May 22, Mexican gray wolf F1226 (affectionately nicknamed Belle by supporters) gave birth to a litter of three pups - all females! This is the second litter born to mom (age six), and dad (M1133 or Rhett), (age nine). With parents, newborns, and the pair’s three yearlings born in 2016, the public has an opportunity to study the complex social structure of a multigenerational pack. Unbeknown to the wolves, WCC webcams allow a global audience to observe their behavior 24/7. Shy and always with a family member, f1619, a.k.a. Jean, is the quietest of her litter, but that doesn’t make her any less fierce! On May 22, Mexican gray wolf F1226 (affectionately nicknamed Belle by supporters) gave birth to a litter of three pups - all females! This is the second litter born to mom (age six), and dad (M1133 or Rhett), (age nine). With parents, newborns, and the pair’s three yearlings born in 2016, the public has an opportunity to study the complex social structure of a multigenerational pack. Unbeknown to the wolves, WCC webcams allow a global audience to observe their behavior 24/7. Mexican gray wolf f1621, named Nita in honor of a dedicated champion for the loba’s wild kin, has been a spitfire from the start! Although her eyes had yet to open, during her first health exam at one week old, Nita wouldn't stop growling. On April 30, 2018, first-time parent F1505 (affectionately nicknamed, “Trumpet” for her loud squeals upon her birth in 2016) welcomed three pups - two males and one female. Following in their mother’s footsteps, the noisy newborns entered the world amongst a chorus of sounds. Trumpet’s solo act has grown into an orchestra of growls, yips, and peeps! The squeaky sounds are not only adorable, but are so rarely heard on the wild landscape. m1742 and his siblings have embraced their role as the kiddos of the family; they've been observed causing havoc and running their parents ragged, but they're also fond of snuggling in leaf piles for afternoon naps. On April 30, 2018, first-time parent F1505 (affectionately nicknamed, “Trumpet” for her loud squeals upon her birth in 2016) welcomed three pups - two males and one female. Following in their mother’s footsteps, the noisy newborns entered the world amongst a chorus of sounds. Trumpet’s solo act has grown into an orchestra of growls, yips, and peeps! The squeaky sounds are not only adorable, but are so rarely heard on the wild landscape. m1743 and his siblings have embraced their role as the kiddos of the family; they've been observed causing havoc and running their parents ragged, but they're also fond of snuggling in leaf piles for afternoon naps. On April 30, 2018, first-time parent F1505 (affectionately nicknamed, “Trumpet” for her loud squeals upon her birth in 2016) welcomed three pups - two males and one female. Following in their mother’s footsteps, the noisy newborns entered the world amongst a chorus of sounds. Trumpet’s solo act has grown into an orchestra of growls, yips, and peeps! The squeaky sounds are not only adorable, but are so rarely heard on the wild landscape. f1744 is the lone girl among two rambunctious boys but she's more than willing to take part in their antics, and can often be seen playing and wrestling with her brothers. On May 8, 2018, Mexican gray wolf F1143 (Rosa) gave birth to a baseball team of pups - six males and three females! Although the family of eleven resides off-exhibit at the WCC, webcam watchers love watching Rosa and Alléno chase their baseball team of pups! A global audience has been falling in love with the teeny tiny twosome - the male runt (m1746) and female runt (f1752 ). They might be small in size, but the spirited pair have big personalities! The little lobos are half the size of most of their seven other siblings but are otherwise healthy and thriving. On May 8, 2018, Mexican gray wolf F1143 (Rosa) gave birth to a baseball team of pups Rosa - six males and three females! Although the family of eleven resides off-exhibit at the WCC, webcam watchers love watching Rosa and Alléno chase their baseball team of pups! A global audience has been falling in love with the little lobos. They've witnessed their first steps, their first howls, and much more! On May 8, 2018, Mexican gray wolf F1143 (Rosa) gave birth to a baseball team of pups Rosa - six males and three females! Although the family of eleven resides off-exhibit at the WCC, webcam watchers love watching Rosa and Alléno chase their baseball team of pups! A global audience has been falling in love with the teeny tiny twosome - the male runt (m1746) and female runt (f1752 ). They might be small in size, but the spirited pair have big personalities! The little lobos are half the size of most of their seven other siblings but are otherwise healthy and thriving. 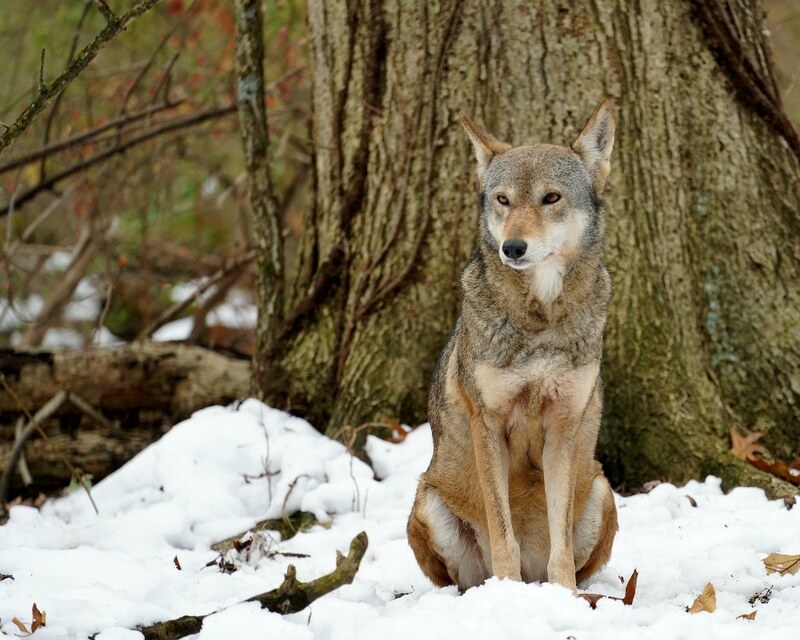 The red wolf (Canis rufus) is one of the world’s most endangered wild canids. 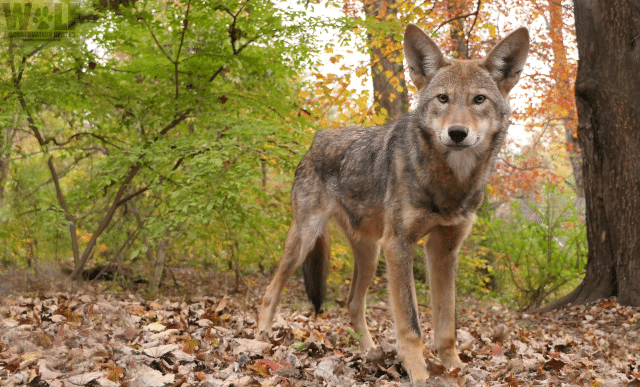 Once common throughout the southeastern United States, red wolf populations were decimated by the 1960s due to intensive predator control programs and loss of habitat. 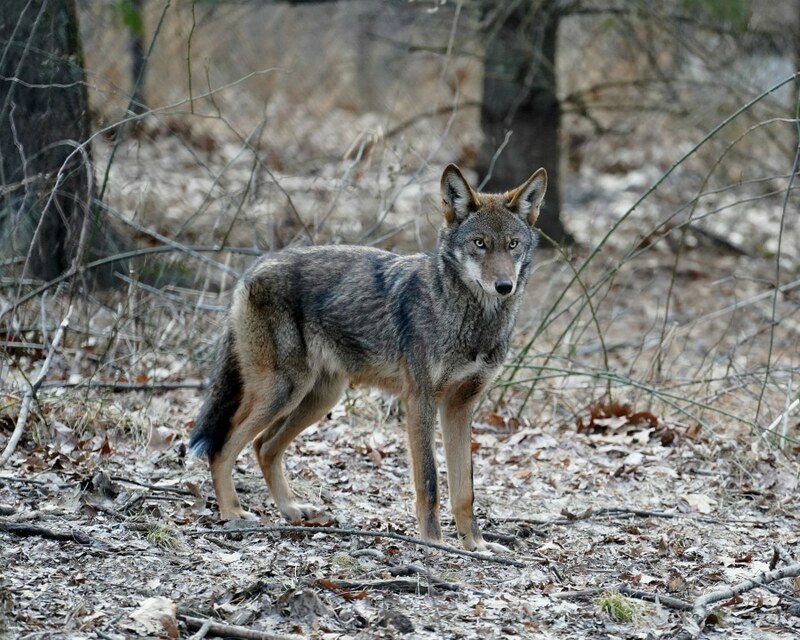 A remnant population of red wolves was found along the Gulf coast of Texas and Louisiana. After being declared an endangered species in 1973, efforts were initiated to locate and capture as many wild red wolves as possible. Of the 17 remaining wolves captured by biologists, 14 became the founders of a successful captive breeding program. 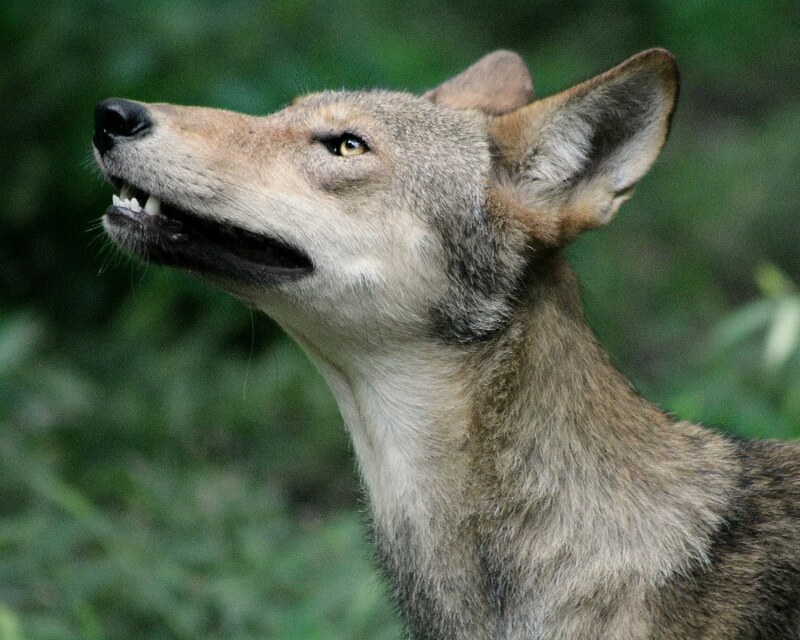 Consequently, the United States Fish and Wildlife Service (USFWS) declared red wolves extinct in the wild in 1980. Today, a there is a single wild population comprising of only 24 known individuals. Tyke (M2118) was born on May 2, 2015, at the Wolf Conservation Center to parents Moose (M1803) and Salty (F1563). The rambunctious pup quickly distinguished himself from his siblings through his unique sense of humor. With four littermates and three older siblings, someone needed to break the frequent tension! Today Tyke lives off-exhibit with his littermate Moose Jr (MJ or M2119). Webcam watchers often glimpse the playful wolf coaxing his sibling into a quick wrestling match or romp about the enclosure. While Tyke hasn’t yet been slated to breed, he seems quite content in his role as the self-appointed jokester. Every family needs one! Moose Jr or MJ (M2119) was born on May 2, 2015, at the Wolf Conservation Center to parents M1803 (Moose) and F1563 (Salty). As is often the case with wolf pup litters, a hierarchy is established at an early age, and this litter was no exception. MJ quickly positioned himself as the dominant one amongst his littermates, and this dominant behavior has only increased as he’s grown. Rather than shy away from unknown sights and sounds, as his siblings do, MJ often approaches unfamiliar things in a curious yet cautious manner. This unique personality trait, coupled with his innate dominance, as firmly cemented his position as one of the leaders in his family group. Today MJ lives off-exhibit with his littermate Tyke (M2118). F2121 was born on May 2, 2015, at the Wolf Conservation Center to parents M1803 (Moose) and F1563 (Salty). The only female in a litter of five pups, F2121 (affectionately nicknamed “Charlotte”) distinguished herself from her brothers through her shy nature; visitors rarely saw her during on-site programs, but webcam watchers grew to love her quiet demeanor. Although she no longer resides with her brothers, her quiet nature has matured into a graceful, calm spirit that often serves as a soothing counterbalance to her mate, M1606 (Jack) who is quick to investigate the slightest disturbance. The dynamic duo personifies the adage “opposites attract”; an attraction so strong that it culminated with pups on April 19, 2018 -three males and one female! Congrats Charlotte and Jack! Family is of the utmost importance to wolves, something red wolf Sam (M1784) certainly feels quite strongly about. The eight-year-old who was transferred in 2017 to the WCC from the Museum of Life and Science in Durham, N.C., where he and his family made national headlines due to some…adventures…this past summer. Sam’s mate, Veronica (F1858), gave birth to a litter of four pups in the spring of 2017 and Sam immediately embraced his new role as a father. Keepers observed him continually bringing food to mate and the pups – he even brought the pups a rat when they were three weeks old! Be still, our beating hearts! However, Sam officially clinched the “Father of the Year” award when he stayed cool under the pressure of having all four of his pups escape their enclosure at the zoo. Rather than panic, as many fathers would do in his situation, Sam regurgitated food and fed it to the pups through the fence! The adventurous family was transferred to the WCC in the fall of 2017 because, due to the genetic value of couple’s offspring, the pair was chosen to breed again in 2018 and required a larger enclosure fit for a growing family. Making the move turned out to be a great idea because, on April 19, 2018, the couple welcomed their second litter - this time four boys and two girls! The family of twelve reside off exhibit but can be viewed via live webcams. The word “superhero” comes to mind when one thinks of Veronica (F1858). Veronica is considered to be one of the most genetically valuable wolves in the red wolf recovery program, so the birth of her four pups in spring 2017 was met with joyous exclamations from all who value red wolf recovery. Veronica, her mate Sam (M1784), and her four pups journeyed to the WCC in the fall of 2017 from their home at the Museum of Life and Science in Durham, N.C. , where they made national headlines last summer when the pups escaped from their enclosure at the zoo (and were safely captured, of course)! What a way to welcome F1858 to the lifelong role of being a mother! Renewing the badge of motherhood, Veronica had a second litter (but a litter of New Yorkers this time!) on April 19, 2018; four boys and two girls who so far have proven to be less naughty. Although the family of 12 resides off-exhibit at the WCC, webcam watchers love watching Veronica go about her day; the feisty female is a voracious eater and is quick to offer support and love to her family when needed. A superhero, indeed. 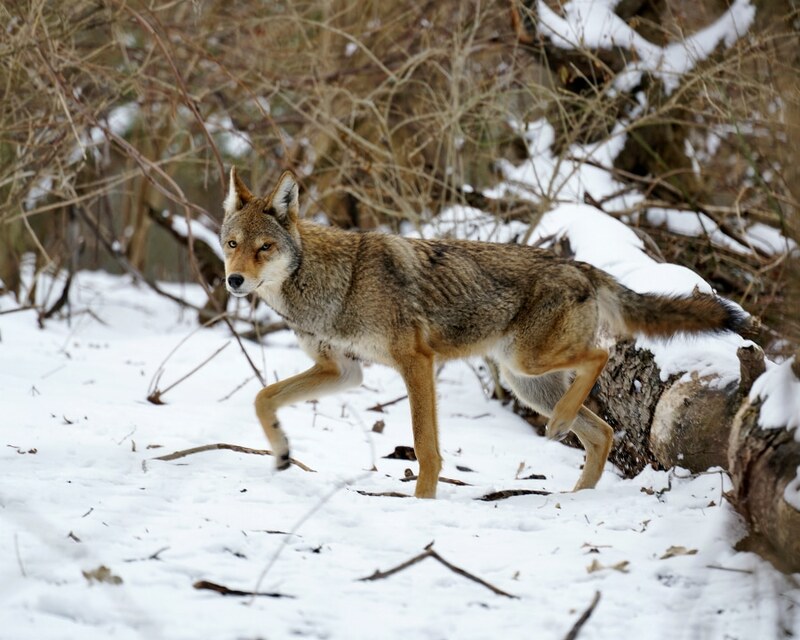 M1606, one of the WCC’s newest red wolves, made quite the entrance when he arrived in December 2017. 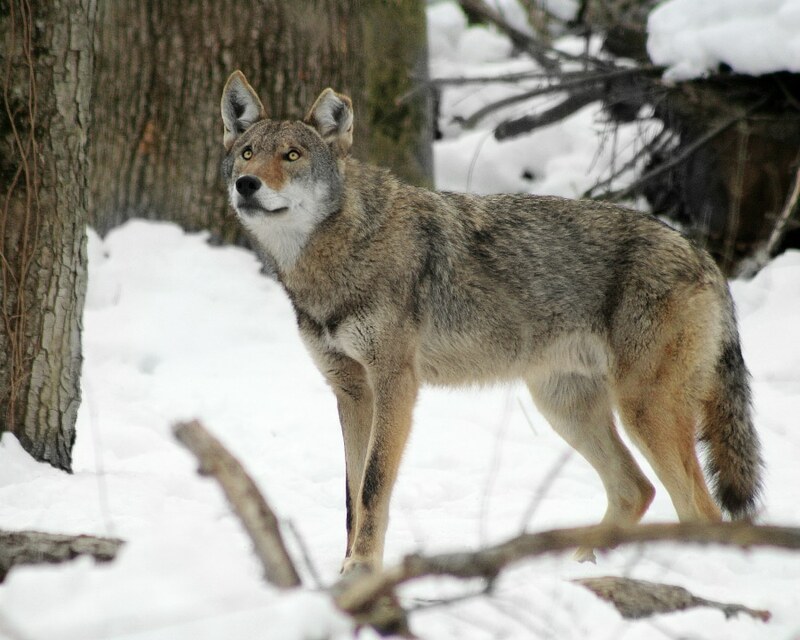 The spunky red wolf, referred to as “Jack”, flew from his former home at U.S. Fish and Wildlife Service’s Sandy Ridge facility in North Carolina on a private plane! Talk about the celebrity treatment! Thanks to Pilots to the Rescue and their volunteer pilots, Jack was able to bypass long airport lines and enjoy a comfortable flight on his way to his new home. 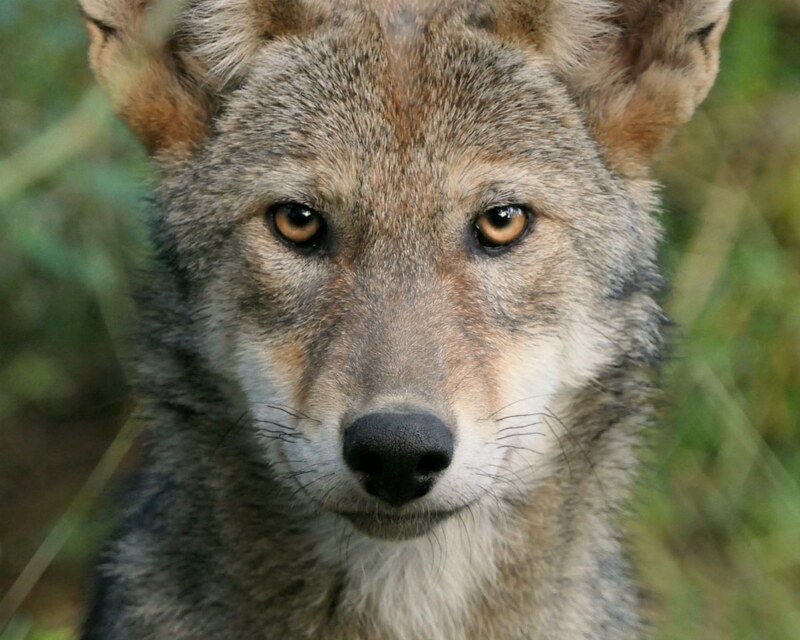 He resides in the WCC’s on-exhibit red wolf enclosure with F2121 (Charlotte) and their four pups born on April 19, 2018! Although he’s shy around people, he can be quite the spitfire when he thinks no one’s watching! Make sure to watch our webcams to catch a glimpse of Jack’s antics! In the early evening of April 19, 2018, red wolf F1858 (affectionately named Veronica) gave birth to a litter of six pups; the four boys and two girls were each no larger than a Russet potato. This was the second litter born to Veronica and her mate M1784 (Sam). With parents, pups of the year, and the pair’s four yearlings, the family of twelve inspires a global audience of supporters via WCC's live webcams. They open the door to understanding the highly social nature of wolves, the benefits of cooperative living, the importance of their endangered kin, and the efforts to save them from extinction. Red wolf Max is the largest male of his litter. At nearly two months old, Max weighed 8.6lbs, second only to his sister "big" Martha (f2242) who weighed in at 9.2lbs. In the early evening of April 19, 2018, red wolf F1858 (affectionately named Veronica) gave birth to a litter of six pups; the four boys and two girls were each no larger than a Russet potato. This was the second litter born to Veronica and her mate M1784 (Sam). With parents, pups of the year, and the pair’s four yearlings, the family of twelve inspires a global audience of supporters via WCC's live webcams. They open the door to understanding the highly social nature of wolves, the benefits of cooperative living, the importance of their endangered kin, and the efforts to save them from extinction. At nearly two months old, Red wolf Shane (m2239) weighed 8.4lbs and was all paws! In the early evening of April 19, 2018, red wolf F1858 (affectionately named Veronica) gave birth to a litter of six pups; the four boys and two girls were each no larger than a Russet potato. This was the second litter born to Veronica and her mate M1784 (Sam). With parents, pups of the year, and the pair’s four yearlings, the family of twelve inspires a global audience of supporters via WCC's live webcams. They open the door to understanding the highly social nature of wolves, the benefits of cooperative living, the importance of their endangered kin, and the efforts to save them from extinction. Weighing 8lbs at nearly two months old, red wolf Hunter (m2241) was the smallest male in the litter, but to his tiny sister Sky Rae (f2243), he's enormous!! In the early evening of April 19, 2018, red wolf F1858 (affectionately named Veronica) gave birth to a litter of six pups; the four boys and two girls were each no larger than a Russet potato. This was the second litter born to Veronica and her mate M1784 (Sam). With parents, pups of the year, and the pair’s four yearlings, the family of twelve inspires a global audience of supporters via WCC's live webcams. They open the door to understanding the highly social nature of wolves, the benefits of cooperative living, the importance of their endangered kin, and the efforts to save them from extinction. At nearly two months old, red wolf Rich (m2238) weighed 8.2 lbs, one pound lighter than his sister Martha (f2242), but in his eyes, you can see the strength of his soul. In the early evening of April 19, 2018, red wolf F1858 (affectionately named Veronica) gave birth to a litter of six pups; the four boys and two girls were each no larger than a Russet potato. This was the second litter born to Veronica and her mate M1784 (Sam). With parents, pups of the year, and the pair’s four yearlings, the family of twelve inspires a global audience of supporters via WCC's live webcams. They open the door to understanding the highly social nature of wolves, the benefits of cooperative living, the importance of their endangered kin, and the efforts to save them from extinction. At nearly two months old, red wolf Martha (f2242) was the biggest of her littermates weighing in at 9.2 lbs! Beyond her size, Martha stands out from the rest with her distinctive white-tipped tail! In the early evening of April 19, 2018, red wolf F2121 (Charlotte) gave birth to a litter of four pups -three males and one female. This was the first litter born to Charlotte and her mate M1606 (Jack). With high pitch peeps and squeals, the adorable newborns announced their debut to a global community of onlookers via the WCC’s network of live webcams. Red wolf pup m2235 and his siblings first started to squeak out un-solicited howls at just a couple of weeks old. By the time they were around five weeks old, the tiny singers never failed to join their parents for a family howl; m2235 and his littermates often howl on the highest point of their vast enclosure, a rounded hill called "Red Rise." In the early evening of April 19, 2018, red wolf F2121 (Charlotte) gave birth to a litter of four pups -three males and one female. This was the first litter born to Charlotte and her mate M1606 (Jack). With high pitch peeps and squeals, the adorable newborns announced their debut to a global community of onlookers via the WCC’s network of live webcams. Look at those ears, red wolf pup m2236! 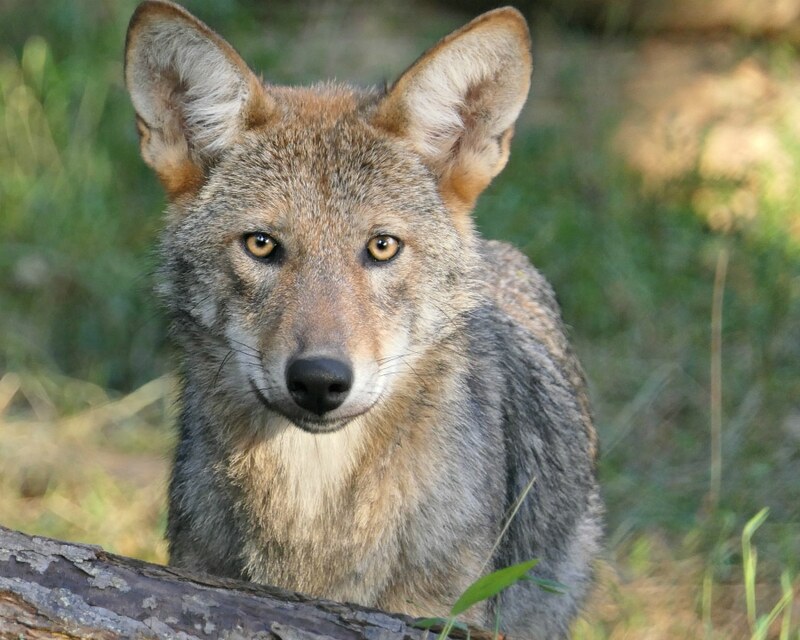 Sure, his big ears help you hear better, and they’re super cute, but as red wolves who are well adapted to the hot, humid climate of the southeastern United States know, big ears are also a great way of dissipating excess body heat. In the early evening of April 19, 2018, red wolf F2121 (Charlotte) gave birth to a litter of four pups -three males and one female. This was the first litter born to Charlotte and her mate M1606 (Jack). With high pitch peeps and squeals, the adorable newborns announced their debut to a global community of onlookers via the WCC’s network of live webcams. Red wolf pup f2237 follows her mom Charlotte pretty closely. Beyond being a great parent, wolf pups are homeschooled, so the parents need to be good educators as well. The parents demonstrate critical hunting skills, parenting strategies and other techniques for the pups to employ when they reach adulthood. Passing down knowledge from one generation to the next allows the family to maintain traditions unique to that pack. On April 28, 2017, red wolf F1858 (Veronica) gave birth to a litter of four pups - two males and two females. These were the first pups born to Veronica and her mate M1784 (Sam), and the naughtiest litter to boot! Residing at the Museum of Life and Science in Durham, N.C., the new family made national headlines when the pups escaped from their enclosure at the zoo! 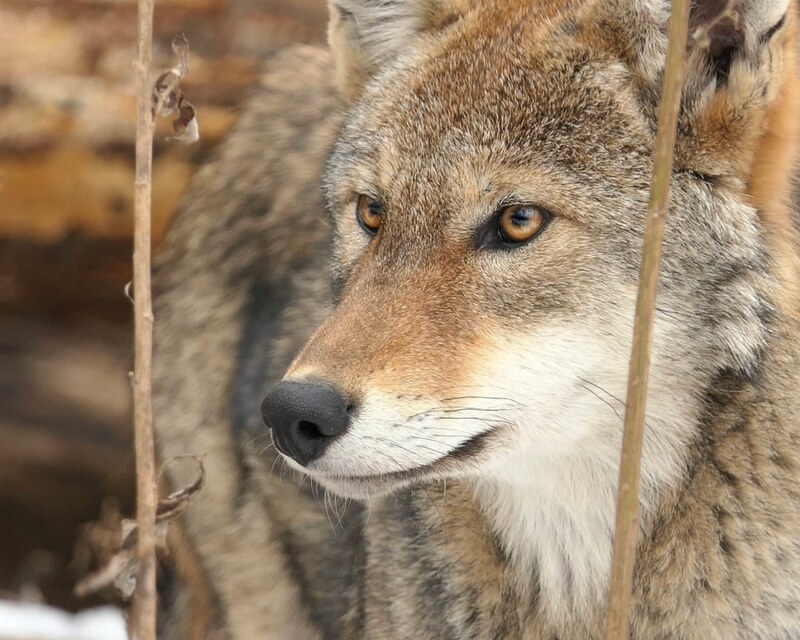 Among the little escape artists was red wolf M2206, affectionately called "Notch" for the notch in his ear. 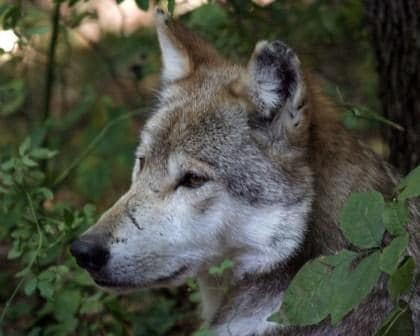 New chapters opened for Notch and his rambunctious littermates in the months that followed their escape in N.C.; in the fall of 2017, the family of six moved to the Wolf Conservation Center, the following April, their mother Veronica gave them six newborn siblings - four males and two females! Although the family of 12 resides off-exhibit at the WCC, webcam watchers love watching Notch employ parenting strategies in his new role as babysitter. Raising pups is a family affair and Notch has taken a leadership position among his siblings. This is key, as passing down knowledge from one generation to the next allows the family to maintain traditions unique to that pack. On April 28, 2017, red wolf F1858 (Veronica) gave birth to a litter of four pups - two males and two females. These were the first pups born to Veronica and her mate M1784 (Sam), and the naughtiest litter to boot! Residing at the Museum of Life and Science in Durham, N.C., the new family made national headlines when the pups escaped from their enclosure at the zoo! Among the little escape artists was female red wolf M2208. 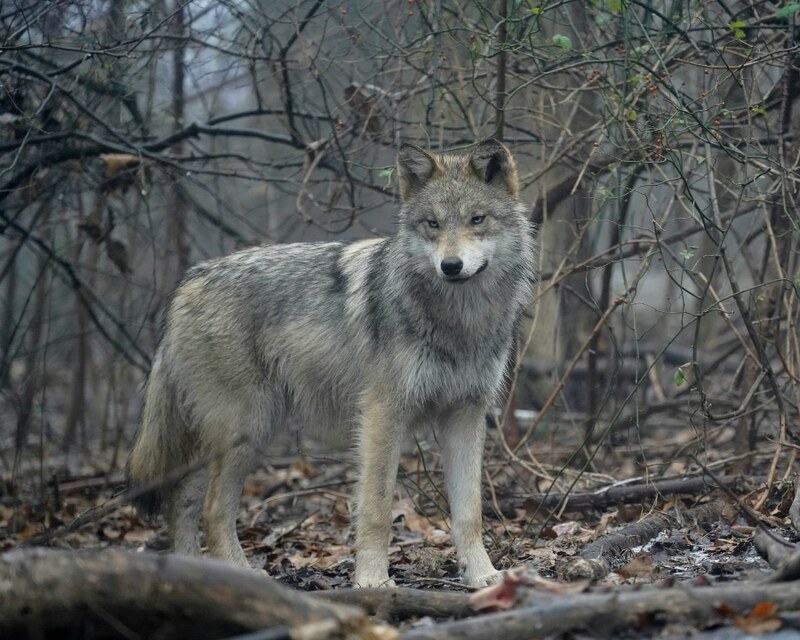 New chapters opened for M2208 and his rambunctious littermates in the months that followed their escape in N.C.; in the fall of 2017, the family of six moved to the Wolf Conservation Center, the following April, their mother Veronica gave them six newborn siblings - four males and two females! Although the family of twelve resides off-exhibit at the WCC, webcam viewers love watching M2208 and his three littermates chase and test their younger siblings. Here's hoping they don't teach the youngsters any of their tricks! On April 28, 2017, red wolf F1858 (Veronica) gave birth to a litter of four pups - two males and two females. These were the first pups born to Veronica and her mate M1784 (Sam), and the naughtiest litter to boot! Residing at the Museum of Life and Science in Durham, N.C., the new family made national headlines when the pups escaped from their enclosure at the zoo! Among the little escape artists was red wolf F2210, the mischievous female who might have been the leader of their caper - she's the feistiest goofball of the bunch! New chapters opened for F2210 and her rambunctious littermates in the months that followed their escape in N.C.; in the fall of 2017, the family of six moved to the Wolf Conservation Center, the following April, their mother Veronica gave them six newborn siblings - four males and two females! Although the family of twelve resides off-exhibit at the WCC, webcam viewers love watching F2210 and her three littermates scramble to corral their younger siblings. Here's hoping they don't teach the youngsters any of their tricks! On April 28, 2017, red wolf F1858 (Veronica) gave birth to a litter of four pups - two males and two females. These were the first pups born to Veronica and her mate M1784 (Sam), and the naughtiest litter to boot! Residing at the Museum of Life and Science in Durham, N.C., the new family made national headlines when the pups escaped from their enclosure at the zoo! Among the little escape artists was female red wolf F2211. 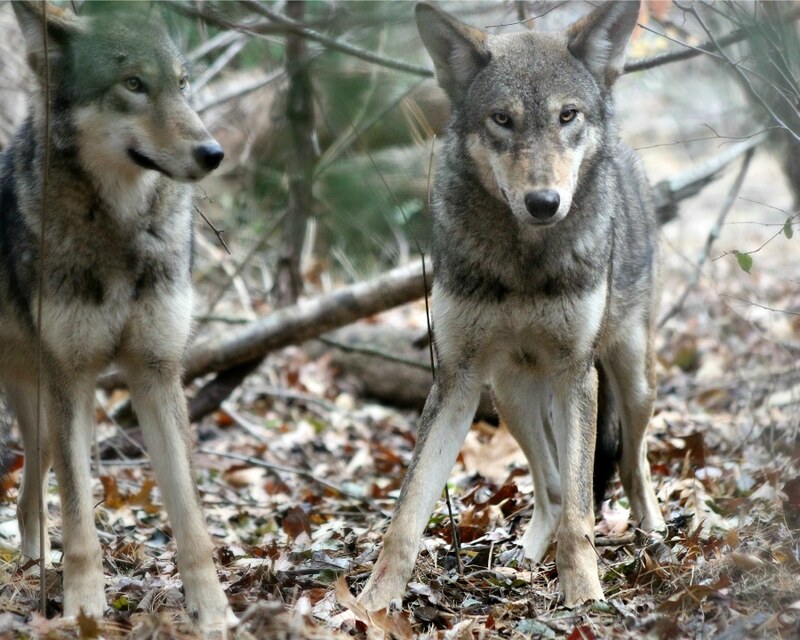 New chapters opened for F2211 and her rambunctious littermates in the months that followed their escape in N.C.; in the fall of 2017, the family of six moved to the Wolf Conservation Center, the following April, their mother Veronica gave them six newborn siblings - four males and two females! Although the family of twelve resides off-exhibit at the WCC, webcam viewers love watching F2211 and her three littermates chase and test their younger siblings. Here's hoping they don't teach the youngsters any of their tricks!